Like so many others, Afghans came to the Cockburn district in response to the gold rushes of the 1880s and 90s. Fremantle was booming as the port town that supplied all the hopeful miners and new migrants, and the Cockburn district flourished in turn. Camels, ideal pack and riding animals for the harsh desert conditions of the gold mining areas, quickly became a hot commodity, and by the mid-1890s were being imported by the hundred. They came both from their original homeland, Afghanistan, but also from South Australia, where they had been bred for some decades already. And with them came the cameleers, collectively known as Afghans but originating from India, Afghanistan, Turkey, and Egypt. Most shipped out of Karachi in modern-day Pakistan. both coming from Karachi, arriving in Fremantle in October 1887. The shipping agents for the Abergeldie, J. & W. Bateman, were reported to be ‘somewhat astonished’ at the camels’ arrival: they had been sent a letter announcing the shipment, but the camels arrived before the letter. The camels, numbering over 300, were property of the company Meer Dost Khan & Co., and seem to have been brought out speculatively, as the animals were already in heavy use in other colonies for desert exploration and gold mining activities. However, Western Australians saw little use for them, and at several auctions held in the Beaconsfield vicinity in late 1887 and early 1888, most of the creatures remained unsold. In fact, the experiment was such a disaster that Meer Dost Khan’s representatives ran out of money and could not feed the cameleers who had come over with the camels. These 23 men were living at Albert’s Piggery on Rockingham Road (somewhere near modern-day Clontarf Road) and were on the verge of starvation. At a Fremantle court hearing to solve the problem in January 1888, Saibdad Dumah Khan, a cameleer fluent in English, stated that he and his fellows had been sent out to keep the camels when they first arrived, but that there was no work for them now. For a while they had been given jobs cutting wood in the bush around Hamilton Hill, but for some weeks they had been living at the piggery without any occupation, and were starving. They were eventually sent on to South Australia, where others in their line of work were waiting for them and their camels would be welcomed. After the initial failure of the late 1880s, Western Australia began to wake up to the potential of camels. Several gold strikes had hopeful miners flooding into the colony, bringing with them the knowledge of navigating harsh outback environments with these ships of the desert. By the mid-1890s there were regular shipments of camels, accompanied by Afghan cameleers, arriving in the colony. Originally these camels were landed at Fremantle and walked through the town, but they were found to frighten any horses that came near them. Instead they were brought to Robb Jetty and taken off ships there, later to be walked through the streets of Fremantle by night so as not to scare thehorses. The extension of Robb Jetty in 1894 would also have allowed for easier unloading of such large and ungainly animals, who usually had to be lifted off ships with slings. At Robb Jetty the camels were examined for disease and infection, and they often had to be quarantined before being sent on to the goldfields. This happened initially at Woodman Point, but conflicting shipments and the threat of further contamination meant that extra space had to be found. In January 1895 a mob of 143 camels which had been in quarantine at Woodman Point since late December 1894 were ousted by a new shipment, and moved inland to Davilak accompanied by 12 Afghan camel drivers. For the next three years the land around Davilak, sometime home of the Manning family and currently a heritage listed site at Manning Park, was in regular use as a camel quarantine paddock. 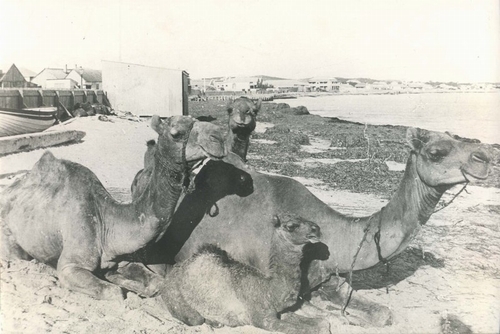 As camels began to stream into the colony, other quarantine areas were set up all around the metropolitan area, such as at Subiaco, where a shipment of 317 camels was walked after landing at Robb Jetty in 1895. The cameleers were enterprising businessmen. While their camels were in quarantine at Davilak, they found local agents to advertise in the newspapers and had their beasts on display for potential buyers to see. ‘Available to view at Davilak Paddock’ was a common advertising phrase. Men with names like Mohamad Yab, Hasamal Malchand, Muddoo Khan, and Abraham Mahomet brought large quantities of camels into the area and generally made a good profit from their sales. ‘Camels for sale’, West Australian, 8 Feb 1895, p.2; ‘News of the week’, Western Mail, 9 Feb 1895, p.13; ‘News and notes’, West Australian, 4 Mar 1895, p.4. Some unlucky ones, like Muddoo Khan, found their animals quarantined for 54 days with mange, while the inspectors refused to allow them to administer medicine or even food. Khan, starting out with 120 camels, watched his flock dwindle to 77 as they died of starvation in the limited vegetation of the paddock. After his requests to move them and treat them were refused, he finally flouted the stock inspectors and moved the camels anyway. For this he was taken to court and fined £10 plus court costs for his troubles. Out of necessity the cameleers would call Davilak or the surrounding Hamilton Hill area home while their camels were kept in isolation. Quarantine times could be a couple of weeks, or more than a month, depending on the contagion. The men would camp beside the paddocks in tents or lease huts from local families like the Dixons. A tragic story unfolded in late 1896, when the body of an Afghan man was discovered hidden in the bush at Hampton Hill swamp, near modern-day Ommaney Street, in Hamilton Hill. The body was that of Abdul Hoosin (probably Hussein in today’s spelling), who had been living with his servant Moolshan, and another Afghan cameleer named Ramsan on the Dixon’s property while their camels were in quarantine nearby. Abdul Hoosin had been murdered by Moolshan, who hid the body, sold his master’s camels as his own, and fled the country for Karachi before the crime was discovered. During the court case, the Dixon family were revealed to have been very close with the Afghans living just outside their doors. Abdul and Moolshan lived in an outhouse about 100 yards from the Dixon’s house, and Ramsan lived nearby in a tent. All three were friendly with the family, who knew them well enough to notice when Abdul went missing, and to be confused that he didn’t say goodbye to them. It seems that Abdul, who was noted for dressing in very fine Western-style clothes, may have been courting one of the Dixon daughters, Charlotte - a lock of her golden hair was found in his coat pocket, which she freely admitted giving. After 1897 there are no more mentions of quarantining camels at Davilak. In 1899 the Governor set aside a portion of land at Owen Anchorage to be a new stock quarantine station, coinciding with the beginning of the livestock and abattoir boom in the Robb Jetty area. Afghans provided a vital service to Western Australia, using their camels to deliver food and stores to remote minesites and newly-built towns, as well as helping to build railways and water pipelines. Ironically, they were participating in their own redundancy, as goods and water were soon able to be transported without the help of the once-indispensable camels. By the late 1910s and early 1920s, railways and cars had replaced camels, and though some remained and built their lives in Western Australia, the Afghans had mostly moved on. Further reading: Visconti, M., ‘The Afghans and their camels in Australia’. Antipodes, Vol. 14 No. 1, June 2000 ; Willis, B., ‘From indispensability to redundancy, the Afghans in Western Australia 1887 - 1911’. Papers in Labour History, No.9, June 1992 ; Jones, P. & Kenny, A., Australia's Muslim cameleers : pioneers of the inland 1860s-1930s. Wakefield Press, 2010.